When it comes time to make the decision to invest in an industrial steam vapor cleaner for your business, there are a lot of things you want to look at. Business owners have been making the wise decision to invest in dry steam vapor to clean their offices, warehouses, restaurants, and more. The pressurized steam from an industrial dry steam cleaner offers a number of benefits that you simply will not find with other cleaning devices. The high temperatures that the steam in an industrial steam cleaner reaches are paramount for effective cleaning and sanitization. Residential steam cleaners rarely produce high enough temperatures to achieve the same level of effectiveness as industrial units. This is certainly one of the first things you want to look for. Your main concern here is verifying whether the unit you are looking at is providing the temperatures of the active steam of the temperatures reached within the boiler unit. Inside the boiler, temperatures of the water and steam can reach and even exceed 300 degrees. Those same temperatures can drop quickly, however, as they leave the steam chamber of the boiler unit. The active steam is that which is discharged from the nozzle end of the cleaner. This is the temperature that is most important, because this is the steam that will be working to clean surfaces. If the temperature is high enough, the heat works to break down the molecular bond between dirt, grime, debris, and various surfaces. Those high temperatures can also be effective for killing germs and various bacteria. Virtually all bacteria will be killed once the steam reaches temperatures around 160 degree Fahrenheit and higher. A high quality industrial steam vapor cleaner should reach temperatures between 190 and 200 degrees Fahrenheit, which keeps it cool enough to be safe but hot enough to be effective. 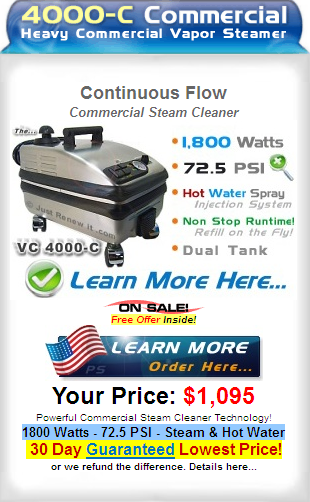 Many steam cleaner vendors and manufacturers will advertise their units producing steam well in excess of 300 degrees Fahrenheit, but this is most likely the temperatures achieved within the boiler, so be sure to double check the facts before making any final decisions on which industrial dry steam cleaner to buy. While verifying facts of the boiler on these cleaning units, it is also important to verify the boiler size. 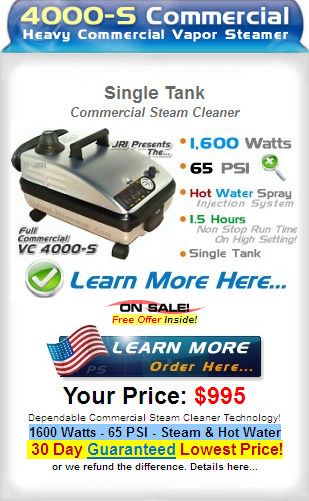 Many industrial steam cleaners will list their specs as having a boiler that is a 3 quart or 3 liter, for example. What they do not always tell you is the actual water capacity of the boiler. The boiler usually has both the water chamber and a chamber for the steam pocket. Ask the representative how much the water the unit holds. Have them measure out the water and put into the reservoir to verify it. The amount of water the industrial vapor steam cleaner reservoir holds is important, because it speaks to the usefulness of the unit. If you plan on cleaning larger areas, having to refill the reservoir more often will slow down the entire process. This somewhat defeats the purpose of industrial dry steam cleaners is supposed to be efficient and fast while offering the best in cleaning and sanitization. Where pressure washers create a large mess with excess water, dry steam cleaners do not. Scrubbing with rags, sponges, and towels can take forever and wear us down, but dry steam makes it easy. Another important aspect of the industrial steam vapor cleaners is the lack of necessity for the various cleaners, degreasers, and other cleaning agents we typically rely upon. Consider how much money the business typically spends monthly or annually on different cleaners. Those cleaners are literally money down the drain. Some work, some do not. In any event, they can be a bit problematic to use in the work space. Cleaning chemicals can cause allergies and worse. They may not be safe to use on certain surfaces and who wants all those chemicals where they prepare or eat food? Some people may have a reaction due to asthma or other pre-existing conditions, which means the use of the cleaners needs to be judicious, often done after working hours or on weekend. If the cleaning can be done simply with water through the power of an industrial dry steam cleaner, it ends up better for you and your company. Furthermore, by using fewer cleaning agents, your company is making steps toward being green. There is less harmful chemical waste and less garbage from the containers. Of course, water and steam may not be enough for all situations. The manufacturers of industrial steam cleaners understand that. That is why they make models with a variety of different features. Some industrial dry steam cleaners have a cleaning agent reservoir along with the water reservoir. This allows those who have special cleaning requirements to be able to use a mixture of pressurized steam and cleaning agents to clean a wide variety of surfaces. At the same time, sometimes, the water reservoirs available just will not be big enough for certain tasks. For those jobs, the have continuous flow models. These hook up to a hose througha faucet and continually push water into the boiler so that it never runs low or runs out. That can really help out with the bigger jobs. 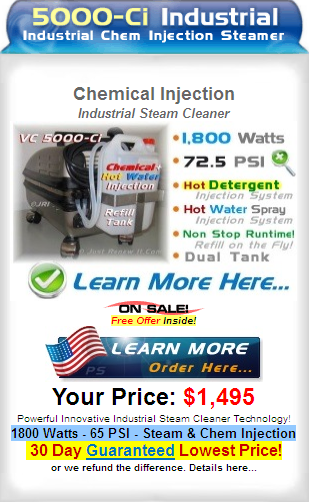 Another items to look at is the tools and attachments available with your industrial dry steam cleaner. Different models have a variety of metal brushes available to help scrub and break up heavy stains, grease, grime, and so on. Those brushes might be brass or stainless steel. You might also see items like a squeegee or spreader for the different applications. These units can help you push beyond just cleaning a simple wall or countertop, but help with making things cleaner faster and easier. Those businesses that invest in an industrial steam vapor cleaner are looking for the next generation in cutting costs while boosting efficiency. As efficiency can be increased then profit can be increased. Keeping a clean shop enticing customers to spend time there, lowers the risk of employees getting hurt or taking sick days, and provides an overall better working atmosphere.